This work conforms to much that we are also doing and developing a somewhat different focus which is hardly surprising. 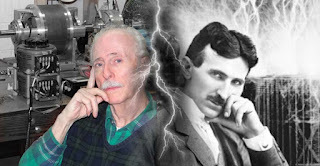 His work more demonstrates that a number of capable researchers are working Tesla's ideas to serious profit. We are doing much better but the reason for that happens to be subtle. What we do welcome is an army of folks working with these ideas and producing a range of new technical solutions. We have long entered the realm of engineering art. That takes unlimited free man hours. In 2012, the total energy output from wind power alone in the US surpassed 60 gigawatts, enough capacity to power nearly 15 million homes. While renewable energy sources such as wind, solar, and hydro have been widely criticized as being inefficient to meet the nation’s energy demands, the obvious truth is that through the use of technologies like the SEPRS device, we can more than meet our energy needs. In addition to re-discovering Tesla’s technological secrets, Jim is also dedicated to revealing those secrets for the benefit of everyone. While he has independently secured funding for his technology already, Jim is also trying to secure funding to publish a book which will explain to everyone how it is done. If you would like to assist Jim you can donate to his Go Fund Me [see below]. See - no windings on central shaft rotor. When Jim Murray presents his ideas he usually presents them as a story. Often a long winded one, like his life story in his video presentations or his written ones. He tries to lead the listener sequentially through his thought process that includes all the ups and downs. This can sadly become quite confusing because most people aren’t well versed in the concepts to begin with. While it is unclear to me if the Dynaflux makes use of “Energy Resonance” in the reflected way… it does something else to recycle energy. The alternator works on the principle of pulsing a large magnetic field and causing a rotor to spin based on geometry. The energy used to pulse the rotor is recovered/recaptured and then sent back to the input. This is very similar to the Bedini spike capture technology in principle. It is also what Paul Babcock is attempting to do with his motor. The unique thing about the dynaflux is that it creates a rather interesting almost paradoxical case.